What is TIF / Esophyx? A huge advance in the evolution of the treatment of GERD, the revolutionary TIF (Transoral Incisionless Fundoplication) procedure corrects the root cause of GERD, an anatomic deficiency at the gastroesophageal junction. Performed with the innovative EsophyX surgical device, the procedure reconstructs a durable antireflux valve and tightens the LES (Lower Esophageal Sphincter), reestablishing a barrier to reflux and restoring the competency of the gastroesophageal junction. The result is the effective elimination of GERD. Is TIF / Esophyx truly incisionless? TIF is a completely incisionless procedure performed safely, quickly, and with minimal patient downtime. The procedure is called a Natural Orifice Surgery (NOS) procedure because the EsophyX device is introduced into the body through the mouth, rather than through an abdominal incision. The advantages of incisionless surgery over conventional laparoscopic or open GERD surgery include shorter hospital stay, reduced patient discomfort, shortened patient recovery, no visible scars, and typically higher patient satisfaction. How is TIF / Esophyx performed? 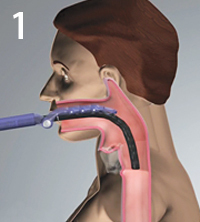 Performed with the patient under general anesthesia, the EsophyX device is introduced into the body transorally (through the mouth) and advanced into the esophagus under visualization of a video camera inserted down the central shaft of the device. The EsophyX device is then used to form and fasten several tissue folds, or plications, to create a robust antireflux valve at the gastroesophageal junction, resulting in the effective elimination of GERD. Most patients go home the next day and can return to work and most normal activities within a few days. In the weeks following surgery, a natural healing process fuses and cements the applications to create a durable antireflux barrier. 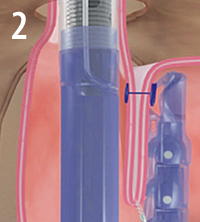 The specially designed EsophyX device enters the esophagus through the mouth and is positioned at the junction of the stomach and esophagus. 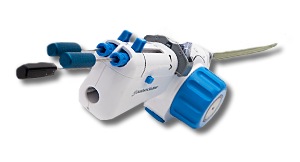 The device forms and fastens tissue folds to create a valve, recreating natural anatomy.